Pancreatic surgery is a technically challenging intervention with high demands for preoperative diagnostics and perioperative management. 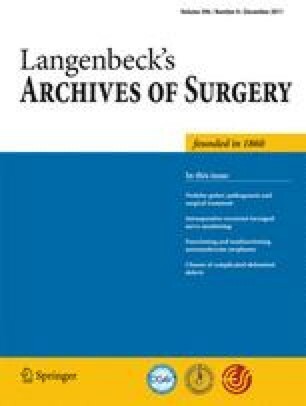 A perioperative mortality rate below 5% is achieved in high-volume centers due to the high level of standardization in surgical procedures and perioperative care. Besides standard resections, certain indications may require individualized surgical concepts such as tumor enucleations. The aim of the study was to evaluate the indications, technique, and outcome of this limited local approach compared to major resections. Data from patients undergoing pancreatic surgery were prospectively recorded. All patients with tumor enucleations were compared with classical resections (pancreaticoduodenectomy or left resection) in a matched-pair analysis (1:2). Tumor type, localization, operative parameters, complications, and outcome were evaluated. Fifty-three patients underwent pancreatic tumor enucleation between October 2001 and December 2009. Indications included cystic lesions, IPMNs, and neuroendocrine pancreatic tumors. Enucleations were associated with shorter operation time, less blood loss as well as shorter ICU and hospital stay compared to pancreaticoduodenectomy and left resections. The overall surgical morbidity of enucleations was 28.3% without major complications. Leading clinical problems were ISGPF type A fistulas (20.8%) requiring prolonged primary drainage. No surgical revisions were necessary, and no deaths occurred. Pancreatic tumor enucleations can be carried out with good results and no mortality. Decisions regarding enucleations are highly individual compared to standard resections, underlining the importance of treatment in experienced high-volume institutions. Enucleations should be carried out whenever possible and oncologically feasible to prevent the typical complications of major pancreatic resection.